VIZ Media moves into May 2016 with a brand new digital anime update highlighted by a variety of exciting new premieres and simulcast episodes. This month offers new Season 3 episodes from BAKUMAN, new Season 1 adventures of HUNTER X HUNTER, the continuing supernatural action of Season 3 of JOJO’S BIZARRE ADVENTURE: DIAMOND IS UNBREAKABLE as well as newly added Season 2 episodes of the tense sci-fi horror drama, TERRAFORMARS REVENGE. New SAILOR MOON CRYSTAL and NARUTO SHIPPUDEN simulcast premieres round out the latest digital content update. · The creators of DEATH NOTE return with this inspiring tale about the power of dreams. Students Mashiro and Takagi aspire to become professional manga artists. As they team up to pursue their goal, the pair learns what it takes to make it in the manga industry, sharing laughs, tears, romance, the devastation of failure and the glory of success along the way. · BAKUMAN’s final season concludes with the addition of subtitled Episodes 51-75. Enjoy the entire series, Episodes 1-75, now! · The supernatural action adventure of HUNTER X HUNTER Season 1 continues throughout May with newly added Episodes 40-52. Episodes are available to stream in their entirety featuring brand new subtitles that are true to VIZ Media’s original translations of the manga series by Yoshihiro Togashi. · This new story arc sees Jotaro Kujoh traveling to a town called Morioh to meet Josuke, the secret love child of his grandfather, Joseph Joestar! The two JoJo's soon discover that new Stand users are appearing all across town, threatening the lives of the innocent! Don’t miss the JOJO’S BIZARRE ADVENTURE Season 3 subtitled premiere with new episodes added every Friday. · Season 3, Episode 5 premieres on May 6th, Episode 6 on May 13th, followed by Episode 7 on May 20th and Episode 8 on May 27th. · Brand new weekly simulcasts of the latest action packed NARUTO SHIPPUDEN episodes are scheduled to take place every Thursday throughout May. · Catch Episode 459 on May 12th, followed by Episode 460 on May 19th, Episode 461 on May 26th and Episode 462 on June 2nd. · Don’t miss the dubbed premiere of Episode 26 on May 6th! · Enjoy the all-new SUBBED streams of SAILOR MOON CRYSTAL throughout May with a brand new simulcast episode every Monday. · SAILOR MOON CRYSTAL Season 3 action continues with Episodes 31-35 available to stream this month. · Watch Episode 31 on May 2nd, followed Episode 32 on May 9th, Episode 33 on May 16th, Episode 34 on May 23rd and Episode 35 on May 30th. 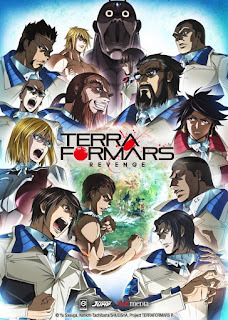 · Based on the hit manga sci-fi series, TERRAFORMARS REVENGE takes place in the far future where humanity terraforms Mars in order to resolve Earth's growing overpopulation problem... But an unintended side effect of the process has unleashed a horror no one could ever have imagined! · Catch the streaming premiere of Season 2, Episodes 5-8 this month. · Episode 5 will premiere on May 6th, followed by Episode 6 on May 13th, Episode 7 on May 20th and Episode 8 on May 27th. VIZ Media’s consolidated online destination for FREE streaming anime content in the U.S. has over 4,200 subtitled and English dubbed episodes and movies from more than 36 series! VIZ Media’s streaming content also reaches an expansive on-demand U.S.-based audience on Hulu, which enables viewers to watch shows anytime, anywhere across devices including Xbox One, PlayStation®4, Roku, Roku TV, Amazon Fire TV, Apple TV, Google Chromecast, and mobile devices. A full list of Hulu -enabled devices can be found at http://www.hulu.com/plus/devices.